Decorative hanging file boxes are a great way to keep your files on hand so that you can locate items you need easily and quickly. From commemorative postcards, letters and pictures to vital business records, they are a way to either have information on hand or to archive it in an accessible manner. File boxes come in a variety of sizes and styles, so you should have no difficulty in finding one that fits with your décor and also meets your needs. Sturdy pasteboard or plastic file boxes can have labels on the front or side, enabling locating content quickly and easily. They are often stackable, which means that they can be placed in a closet or in a safe warehousing area pending such time as the documents are required or that they age out of being needed. A word of caution, however. They should usually not be stacked more than three high or the weight of upper boxes can cause lower ones to split and sag. They really do best on wire racks that enable easy access. If you are a secretary or clerk who works in an office that has frequent public access, one thing you don’t want is stacks of files on your desk. In fact, most employers prefer that only the project on which you are currently working be in view. A rolling file with hanging sleeves can help keep the information you need at hand without unsightly stacks of documents. It can also keep on hand those things that will need attention in the near future. Homes have many things that benefit from being placed in hanging files. These can include pictures, DVDs, letters, bills, and important papers for your home or vehicle. A hanging filing keeps them organized and ready for use or perusal when desired. Below you will find several examples of file boxes, suitable for a variety of décor options or work needs. Some are good for storage, some are sufficiently decorative to keep things out in your living room or kitchen, while others project that crisp, professional air you want for your business. This filing box is designed to hold and protect your files without having them exposed to the light. With the dark fabric appearing laminate, this box works well in areas that have dark wooden tones or dark fabric furniture. The leather pull handle makes sliding this box out from the shelf very easy. With its light brown tone, this letterbox works well in many areas from a wooden stand, a desktop to a shelf by adding to the décor. Perfect for holding and protecting important letters, your DVD collection and more with its height. The lid sits on securely making sure unwanted pests cannot get into your important letters. This wicker and Burmese rattan box makes a great decorative box. The natural honey-brown tone adds a luster to your wicker office or chairs and other light tones in the room. The lid sits securely on the top making a closed box without handles that protect your cherished belongs. These pieces are able to hold a surprising amount of weight compared to how they look. Designed for non-residential use, these drawers hold large legal papers and supplies. The dark wood tone works well with many desks and offices blending in seamlessly. This filing set is not a freestanding set and needs to be mounted. The lockable front protects the contents for you while you are away. With the steel glides, the drawers can support a large weight. The double weave fabric gives this box a sturdy allure. 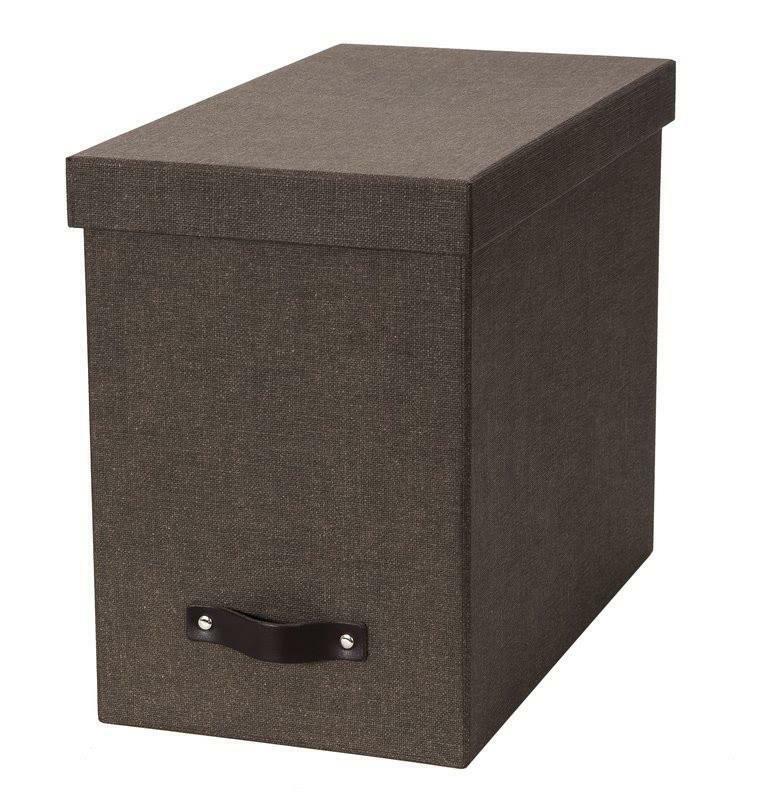 Able to handle medium weights, this file box works well with lightly toned rooms against its dark fabric. Made of steel and plastic, the files inside are protected well. With its open, easy-to-reach handles you can easily lift and move this box as you need. Laying on its side, this box is able to handle your large rolled paperwork. The steel body provides a great deal of protection and can be securely closed with a padlock. With 36 compartments, you can easily keep yourself organized and add labels on the doors so that you know what file is where. This cabinet can handle items from postcards to oversized documents. With its upright set up, this filing box is great for large rolled papers like architect designs or drawings. Its walnut grain allows it to work well in any bright office, making a statement about your tasteful organization skills. It holds up to 20 files so that you can easily work on your active projects without causing a mess. The open design of this filer is ideal for office places where you may need to find files quickly. The files hand securely and you are able to slide the envelopes from the side or top to look through them for information. The cushioned bottom helps prevent scratching up desks. Made of plastic, this file rack holds up to 25 folders. This box is built for work. With its front-facing label slot you can ID what you are keeping inside with ease. The steel handles allow you to carry a sizeable weight in this box. The black and white floral theme works well with any modern styled room or closet, standing out just enough to catch your eye quickly. With a natural wooden stand, this cabinet can hold some serious weight for you. Its seagrass woven baskets are great for paperwork or for toys while being gentle to the eye. The light weave and white wood work well with any light toned walls and floors. The large open faced handle allows for easy access.